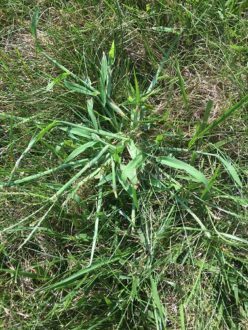 Controlling Crabgrass: Will I get crabgrass this summer? In almost 40 years in the lawn industry, I have never seen such unusual spring weather than this year. Cold, wet and then warm …repeat, Mother Nature couldn’t make up her mind! In the last few weeks many have asked “Is it too late for controlling crabgrass?” Well, the weekend weather has limited our time to apply lawn products; hopefully you were able to apply Green-Up with Crabgrass Preventer in April or in May. Remember, crabgrass germinates over a long period of time, not just when the forsythia blooms. There are many factors that contribute to controlling crabgrass. First, crabgrass only grows in sunny areas of the lawn. Soil and air temperatures can affect how quickly crabgrass germinates. Disrupting the soil after applying crabgrass preventer by raking the soil or kids playing on the lawn can open the floodgates for crabgrass to establish. There are potentially millions of crabgrass seeds in your lawn. They just need to get to the surface, get some warm weather and sunlight and they can take off. It’s now June, if you apply Crabgrass and Weed Preventer now you may get some crabgrass control. Note that I used the words “may” and “some” meaning do not expect 100% control! If you are not interested in trying to prevent crabgrass anymore this year, the best way to curb crabgrass growth is a healthy, thick growing lawn. Feed your lawn and apply grass seed to get grass growing in thin areas before crabgrass blades actually start to show up in July and August. The level of crabgrass establishment will also depend on the weather. If it is a scorching hot and dry summer and your lawn goes dormant or dies, the crabgrass will thrive. Remember, we can’t predict Mother Nature so we have to prepare before the wrath of summer weather arrives. 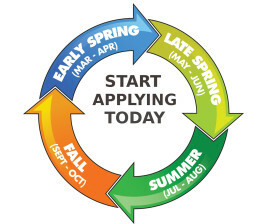 This means following a sound lawn care program starting last fall with feeding and seeding your lawn. The next problem is what about dandelions? They seemed to come out for a day and then disappear with cold weather many times this spring. Control of broadleaf weeds usually happens in May but again the weather confused us all as to how and when to control these weeds. As long as early summer weather does not become hot and dry you can effectively control broadleaf weeds. Temperatures over 85 degrees and grass under stress from heat and drought are not times to try and control broadleaf weeds; you may injure some good grass. Broadleaf weeds have to be actively growing and exposed for best control whether you use granular or liquid control. Be sure with Green-Up Weed and Feed granules you apply to a damp lawn either in early morning when some dew is present or after you lightly sprinkle the grass for 5 minutes. This is best so the granules stick to the weed leaves for best control. Remember, do not mow 2 days before or after you apply it and do not water in after application or have rainfall in the forecast for 2 days after application. Broadleaf weeds can take up to 30 days to disappear from the lawn. The weed killer needs to be absorbed by the plant and then work its way down to the root system for compete control. Large quantities of broadleaf weeds can be present because you have low soil pH. 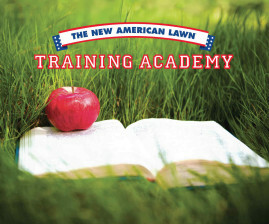 Lawns thrive when the soil pH is between 6.2 to 7.0. Apply Mag-I-Cal for Acidic Soil to raise soil pH levels. 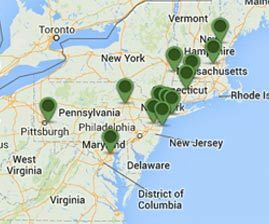 Soil test kits are available at most stores or contact your local Rutgers Cooperative Extension office for a soil test kit. 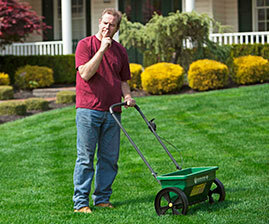 This provides a complete analysis of your soil to avoid future disappointment with your lawn applications. Now it’s time for you to enjoy your first trip to the beach or have a picnic on your picture perfect lawn (I hope! ).